The 88th Annual Academy Awards Sunday night will welcome an interesting first-time television advertiser: LinkedIn. 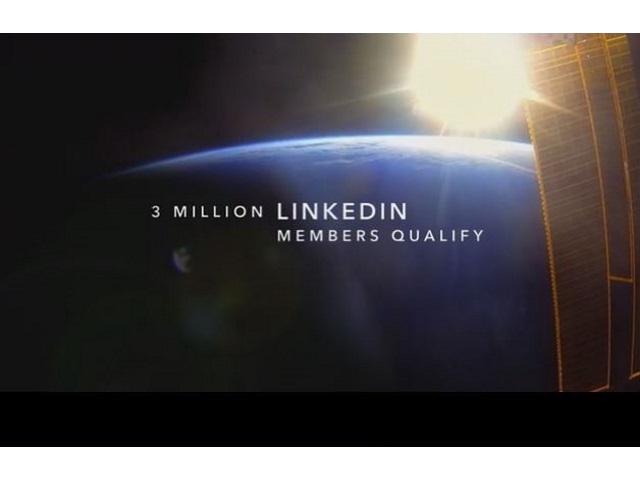 The ad (embedded below), voiced over by LinkedIn CEO Jeff Weiner, states that 3 million LinkedIn members were qualified to be NASA astronauts, and LinkedIn said in an email to SocialTimes that it arrived at that figure by analyzing its membership last year, when NASA sought its help in filling that very position. “You’re Closer Than You Think”—a partnership between LinkedIn’s in-house creative studio and BBDO San Francisco, its newest agency partner, with ad placement handled by Spark SMG—will debut during the Oscars Sunday night, with a print ad to follow in The New York Times Monday. LinkedIn said placements in the weeks following the Oscars may include Jimmy Kimmel’s post-Oscar special, Shark Tank, Fresh Off the Boat and The Family. Everything that LinkedIn does is rooted in its vision to create economic opportunity for the global workforce. This means helping members find jobs, learn from influential people in their industry, build their professional brand and connect to people who can make a difference in their path. This also influences the way LinkedIn builds products, curates content and who and what it promotes, etc. This ad is an extension of the greater sentiment.